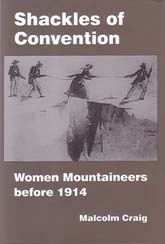 A celebration of the contribution made by women to the early history of mountaineering. Early mountaineering is too easily seen as dominated by men and viewed as among the manliest of activities. Women mountaineers were largely overlooked or if considered tended to be drawn into a debate about women's rights rather than them being acknowledged purely for their achievements as pioneers of mountain climbing by women or as mountaineers. The achievements of women pioneers and mountaineers deserve greater recognition, primarily because all mountaineers are in debt to those who have gone before. Broadly, there are three stages to this story. First, women pioneers of mountain climbing from the late 18th century up to the mid-19th century, who each made one major ascent. Second, mountaineers who returned repeatedly to make first or repeat ascents of mountains. Finally, independent women mountaineers who were shedding the conventions previously imposed on them. The account of women climbing mountains begins in what is now known as the Western European Alps before recording later ascents in South America and the Himalaya. Ascents in New Zealand, South America, and Norway are also included.